The Luna shower curtain is designed and produced by well-known German brand Kleine Wolke, established in 1968, and is backed by their quality guarantee. A luxury, quick dry and easy care polyester fabric, as used in many high end hotels. This elegant curtain features a contemporary theme circles made of small, medium and large dots on a white background. 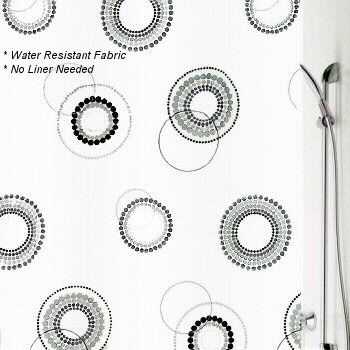 This shower curtain reminds us of the designs we made as kids using a Spirograph drawing toy. Black/Grey : Grey, charcoal and black dots in circle patterns on a white background.